So I got my first Interview on FemmeLounge!!! Let me dance the azonto I've been practicing! That azonto looks easy but it is hard! My body is just not cooperating at all. If you know an easier way I can learn it, please help a sister out! 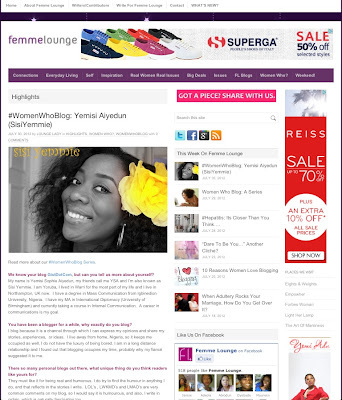 So If you want to see details about the interview, please click on the link---> FEMME LOUNGE . Make una know me now oh, not when I'm on CNN you will now be claiming you dey follow me soak garri oh. Sorry for the break in transmission, I dey write my dissertation and I nor wan fail, money must not waste: wish me luck. Expect a new post next week! Mwaah! Where is the link na? All the best in your dissertation. I really gbadun your interview, congrats dear! congratulobia on the interview...all the best with the dissertation. I was wondering why the posts stalled. Good luck on your dissertation. Sisi Yemmie where in Northampton do you live? Nice interview...hope your desertation went well! Success or better still Excellence. Absolutely Fab!!! this is my first visit and I loved every bit of it. Thumbs up gurl! !